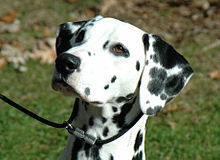 The Dalmatian is a breed of medium-sized dog, noted for its unique black, liver, spotted coat and mainly used as a carriage dog in its early days. Its roots trace back to Croatia and its historical region of Dalmatia. Today, it is a popular family pet and many dog enthusiasts enter Dalmatians into kennel club competitions. White background, black, liver. lemon, blue, or tricolor spots do appear on occasion but they are not acceptable. A tricolor Dalmatian female—with tan spotting on the eyebrows, snout, cheeks, neck, chest, and legs. The Dalmatian is a medium sized, well-defined, muscular dog with excellent endurance and stamina. When fully grown, according to the American Kennel Club breed standard, it stands from 19 to 23 inches (48 to 58 cm) tall, with males usually slightly larger than females. Both the AKC and The Kennel Club in the UK allows height up to 24 inches (61 cm) but that isn't ideal. The outline of the dog should be square when viewed from the side: The body is as long from forechest to buttocks as it is tall at the withers, and the shoulders are well-laid back, the stifle is well-bent and the hocks are well-let down. The Dalmatian's feet are round with well-arched toes, and the nails are usually white or the same colour as the dog's spots. The thin ears taper towards the tip and are set fairly high and close to the head. Eye color varies between brown, amber, or blue, with some dogs having one blue eye and one brown eye, or other combinations.When they are born they have no spots, and they can have black, brown, lemon, blue, or tricolor spots. The Dalmatian coat is usually short, fine, and dense; however, smooth-coated Dalmatians occasionally produce long-coated offspring. Long-coated Dalmatians are not acceptable in the breed standard, however; these individuals experience much less shedding than their smooth-coated counterparts, which shed considerably year-round. The standard variety's short, stiff hairs often weave into carpet, clothing, upholstery and nearly any other kind of fabric and can be difficult to remove. Weekly grooming with a hound mitt or curry can lessen the amount of hair Dalmatians shed, although nothing can completely prevent shedding. Due to the minimal amount of oil in their coats, Dalmatians lack a dog odor ("dog smell") and stay fairly clean relative to many other dog breeds. 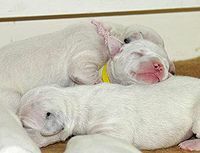 Dalmatians usually have litters of six to nine pups, but they have been known to have larger litters on occasion, such as a massive eighteen puppy brood born in January 2009 (all were healthy). Puppies are born without spots, which develop and darken as the pup ages. A genetic predisposition for deafness is a serious health problem for Dalmatians; only about 70% have normal hearing. Deafness was not recognized by early breeders, so the breed was thought to be unintelligent. Even after recognizing the problem as a genetic fault, breeders did not understand the dogs' nature, and deafness in Dalmatians continues to be a frequent problem. Researchers now know deafness in albino and piebald animals is caused by the absence of mature melanocytes in the inner ear. This may affect one or both ears. The condition is also common in other canine breeds that share a genetic propensity for light pigmentation. This includes, but is not limited to Bull Terriers, Dogo Argentinos, Poodles, Boxers, Border Collies and Great Danes. Typically, only dogs with bilateral hearing are bred, although those with unilateral hearing, and even dogs with bilateral deafness, make fine pets with appropriate training. The Dalmatian Club of America's position on deaf pups is that they should not be used for breeding, and that humane euthanasia may be considered as an "alternative to placement". Deaf Dalmatian puppies can be difficult to home, due to increased aggression and difficulty in managing behavior. Dalmatians with large patches of colour present at birth may have a lower rate of deafness. Selecting for this trait may reduce the frequency of deafness in the breed. However, patches are a disqualifying factor in Dalmatian breed standards in an effort to preserve the spotted coat (the continual breeding of patched dogs would result in heavily patched Dalmatians with few spots). Blue-eyed Dalmatians are thought to have a greater incidence of deafness than brown-eyed Dalmatians, although a mechanism of association between the two characteristics has yet to be conclusively established. Some kennel clubs discourage the use of blue-eyed dogs in breeding programs. Hip dysplasia is another disease that affects nearly 5% of purebred Dalmatians, causing those to experience limping, fatigue, moderate to severe pain, and trouble standing up. Most Dalmatians who eventually develop hip dysplasia are born with normal hips, but the soft tissues surrounding the joint grow abnormally due to their genetic make-up. The disease may affect both hips, or only the right or left hip, leading afflicted dogs to walk or run with an altered gait. Dalmatians, like humans, can suffer from hyperuricemia. Dalmatians' livers have trouble breaking down uric acid, which can build up in the blood serum (hyperuricemia) causing gout. Uric acid can also be excreted in high concentration into the urine, causing kidney stones and bladder stones. These conditions are most likely to occur in middle-aged males. Males over 10 are prone to kidney stones and should have their calcium intake reduced or be given preventive medication. To reduce the risk of gout and stones, owners should carefully limit the intake of purines by avoiding giving their dogs food containing organ meats, animal byproducts, or other high-purine ingredients. Hyperuricemia in Dalmatians responds to treatment with orgotein, the veterinary formulation of the antioxidant enzyme superoxide dismutase. Hyperuricemia in Dalmatians (as in all breeds) is inherited, but unlike other breeds, the "normal" gene for a uric acid transporter that allows for uric acid to enter liver cells and be subsequently broken down is not present in the breed's gene pool. Therefore, there is no possibility of eliminating hyperuricemia among pure-bred Dalmatians. The only possible solution to this problem must then be crossing Dalmatians with other breeds to reintroduce the "normal" uric acid transporter gene. This led to the foundation of the Dalmatian-Pointer Backcross Project, which aims to reintroduce the normal uric acid transporter gene into the Dalmatian breed. The backcross used a single English Pointer; subsequent breedings have all been to purebred Dalmatians. This project was started in 1973 by Dr. Robert Schaible. The first cross (F1) hybrids did not resemble Dalmatians very closely. The F1s were then crossed back to purebreds. This breeding produced puppies of closer resemblance to the pure Dalmatian. By the fifth generation in 1981, they resembled purebreds so much, Dr. Schaible convinced the AKC to allow two of the hybrids to be registered as purebreds. Then AKC President William F. Stifel stated, "If there is a logical, scientific way to correct genetic health problems associated with certain breed traits and still preserve the integrity of the breed standard, it is incumbent upon the American Kennel Club to lead the way." The Dalmatian Club of America's (DCA) board of directors supported this decision, however it quickly became highly controversial among the club members. A vote by DCA members opposed the registration of the hybrids, causing the AKC to ban registration to any of the dog's offspring. At the annual general meeting of the DCA in May 2006, the backcross issue was discussed again by club members. In June of the same year, DCA members were presented with an opportunity to vote on whether to reopen discussion of the Dalmatian Backcross Project. The results of this ballot were nearly 2:1 in favor of re-examining support of the project by the DCA. This has begun with publication of articles presenting more information both in support of and questioning the need for this project. In July 2011, the AKC agreed to allow registration of backcrossed Dalmatians. In 2010, the UK Kennel Club registered a backcrossed Dalmatian called Ch. Fiacre’s First and Foremost. Several restrictions were imposed on the dog. Although the dog is at least 13 generations removed from the original Pointer cross, its F1 to F3 progeny will be marked on registration certificates with asterisks (which "indicate impure or unverified breeding",) no progeny will be eligible to be exported as pedigrees for the next five years, and all have to be health tested. UK Dalmatian breed clubs have objected to the decision by the Kennel Club. All puppies in the Heritage Project are descendants of Dr. Robert Schaible's parent line. Today, "Dr. Schaible’s line produces the only Dalmatians in the world today that are free of a metabolic defect that can lead to urinary tract problems." The FCI recognized Croatia as its country of origin, citing several historical sources. The first illustrations of the dog have been found in Croatia: an altar painting in Veli Lošinj dating to 1600–1630, and a fresco in Zaostrog. 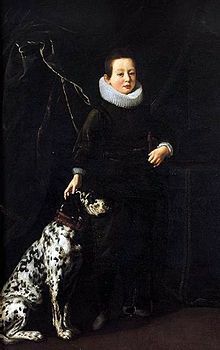 The first documented descriptions of the Dalmatian (Croatian: Dalmatinski pas, Dalmatiner, Dalmatinac) trace back to the early 18th century and the archives of the Archdiocese of Đakovo, where the dog was mentioned and described as Canis Dalmaticus in the church chronicles from 1719 by Bishop Petar Bakić and then again by church chronicles of Andreas Keczkeméty in 1739. In 1771, Thomas Pennant described the breed in his book Synopsis of Quadrupeds, writing that the origin of the breed is from Dalmatia, he referred to it as Dalmatian. The book by Thomas Bewick A General History of Quadrupeds published in 1790 refers to the breed as Dalmatian or Coach Dog. The breed had been developed and cultivated chiefly in England. The first unofficial standard for the breed was introduced by an Englishman Vero Shaw in 1882. In 1890 with the formation of the first Dalmatian Club in England the standard became official. When the dog with the distinctive markings was first shown in England in 1862, it was said to have been used as a guard dog and companion to the nomads of Dalmatia. The breed's unique coat became popular and widely distributed over the continent of Europe beginning in 1920. Its unusual markings were often mentioned by the old writers on cynology. The roles of this breed are as varied as their reputed ancestors. They were used as dogs of war, guarding the borders of Dalmatia. To this day, the breed retains a high guarding instinct; although friendly and loyal to those the dog knows and trusts, it is often aloof with strangers and unknown dogs. Dalmatians have a strong hunting instinct and are an excellent exterminator of rats and vermin. In sporting, they have been used as bird dogs, trail hounds, retrievers, or in packs for wild boar or stag hunting. Their dramatic markings and intelligence have made them successful circus dogs throughout the years. Dalmatians are perhaps best known for working for the firefighters for their role as firefighting apparatus escorts and firehouse mascots. Since Dalmatians and horses are very compatible, the dogs were easily trained to run in front of the carriages to help clear a path and quickly guide the horses and firefighters to the fires. Dalmatians are often considered to make good watchdogs, and they may have been useful to fire brigades as guard dogs to protect a firehouse and its equipment. Fire engines used to be drawn by fast and powerful horses, a tempting target for thieves, so Dalmatians were kept in the firehouse as deterrence to theft. Dalmatians are associated with firefighting, particularly in the United States. In the days of horse-drawn fire engines, dogs would guard the horses, who could easily become uncomfortable at the scene of a fire. Dalmatians were a popular breed for this job, due to their natural affinity to horses and history of being used as carriage dogs. This role became unnecessary once horse-drawn fire engines were replaced with steam and diesel powered ones. Due to its history, the Dalmatian often serves as a mascot for the fire service, and is still chosen by many firefighters as a pet. The Dalmatian is also the mascot of the Pi Kappa Alpha International Fraternity, which has been associated with firefighting. The Dalmatian is also associated, particularly in the United States, with Budweiser beer and the Busch Gardens theme parks, since the Anheuser-Busch company's iconic beer wagon, drawn by a team of Clydesdale horses, is always accompanied by a Dalmatian. The company maintains several teams at various locations, which tour extensively. Dalmatians were historically used by brewers to guard the wagon while the driver was making deliveries. The Dalmatian breed experienced a massive surge in popularity as a result of the 1956 novel The Hundred and One Dalmatians written by British author Dodie Smith, and later due to the two Walt Disney films based on the book. The Disney animated film, released in 1961, later spawned a 1996 live-action remake, 101 Dalmatians. In the years following the release of the sequel 102 Dalmatians, the breed suffered greatly at the hands of irresponsible breeders and inexperienced owners. Many well-meaning enthusiasts purchased Dalmatians—often for their children—without educating themselves on the breed and the responsibilities that come with owning such a high-energy dog breed. Dalmatians were abandoned in large numbers by their original owners and left with animal shelters. As a result, Dalmatian rescue organizations sprang up to care for the unwanted dogs and find them new homes. AKC registrations of Dalmatians decreased 90% during the 2000–2010 period. ^ "Dalmatian Club of America - A Short History of the Dalmatian". www.thedca.org. ^ a b "Dalmatian breed standard". The Kennel Club. Retrieved 19 January 2015. ^ a b "Dalmatian (dog)". www.thekennelclub.org.uk. ^ "''Fédération Cynologique Internationale Standard of Dalmatian'', No. 153, dated 14 April 1999" (PDF). Fci.be. Retrieved 26 October 2011. ^ "Dalmatian – FCI Standard" (PDF). Retrieved 12 August 2013. ^ "American Kennel Club – Dalmatian". Akc.org. Retrieved 26 October 2011. ^ a b c Thornton, Kim Campbell. "THE DALMATIAN". Dog World 89.11 (2004): 24. ^ Forever, Dalmatians. "Dalmatians and 9 Things You Should Know About Them". 5amily. Retrieved 8 March 2019. ^ "The Dalmatian Club of America Health Survey Results: General Dog Information". The Dalmatian Club of America. Retrieved 25 July 2012. ^ Bates, Daniel (9 January 2009). "The dalmatian who gave birth to a bumper litter of EIGHTEEN pups". Daily Mail. London. ^ "When Do Dalmatian Puppies Get Their Spots? | Cuteness". Cuteness.com. Retrieved 11 September 2018. ^ "The Red Book: The Dalmatian Club Of America's Informational brochure regarding Dalmatians". The Dalmatian Club Of America. Retrieved 20 April 2011. ^ "The Dalmatian Club of America Health Survey Results: Health Related Conditions". The Dalmatian Club of America. Retrieved 20 April 2011. ^ "Breed-Specific Deafness Incidence In Dogs (percent)". Lsu.edu. 23 June 2010. Retrieved 26 October 2011. ^ Proctor PH (1988). "Free Radicals and Human Disease". In Weber HH, Miquel J, Quintanilha AT (eds.). Handbook of free radicals and antioxidants in biomedicine. 1. Boca Raton: CRC Press. pp. 209–21. ISBN 978-0-8493-3268-5. ^ "Position on Dalmatian Deafness From the Board of Governors of the Dalmatian Club of America". Dalmatian Club of America. Retrieved 11 March 2012. ^ "DALMATIAN DILEMMA – PART 1". Steynmere.com. Retrieved 26 October 2011. ^ "Reference Materials Concerning Deafness In The Dalmatian". Thedca.org. 14 July 2010. Retrieved 26 October 2011. ^ The Dalmatian Club of America. "Dalmatian Club of America Position Statement Regarding Reducing Dalmatian Deafness". Thedca.org. Retrieved 26 October 2011. ^ "Common Dalmatian Health Problems". Archived from the original on 4 February 2015. Retrieved 20 January 2018. ^ "Hip Dysplasia in Dalmatians – Dog'sHealth.com Blog". Dogshealth.com. Retrieved 2 December 2017. ^ Friedamman, M; S.O Byers (1 September 1948). "Observations concerning the causes of the excess excretion of uric acid in the dalmatian dog". Journal of Biological Chemistry. 175 (2): 727–35. PMID 18880769. ^ Simkin PA (August 2005). "The Dalmatian defect: a hepatic endocrinopathy of urate transport". Arthritis Rheum. 52 (8): 2257–62. doi:10.1002/art.21241. PMID 16052594. ^ Lowrey JC (March 1976). "An unusual diet-derived inflammatory dermatosis in a Dalmatian dog responds to orgotein". Vet Med Small Anim Clin. 71 (3): 289–95. PMID 1045695. ^ Schaible, Robert H. (April 1981). "A Dalmatian Study: The Genetic Correction of Health Problems". The AKC Gazette. Retrieved 13 January 2010. ^ Jensen, Mary–Lynn: Dalmatian Backcross Project. Past, Present and Future. In: Spotter, Fall 2006, p. 44–46 (Journal of the Dalmatian Club of America) Online PDF 296 kB, accessed 1 September 2013. ^ Schaible, Robert H.: Backcross Project: Long–Standing Issues. In: Spotter, Winter 2006, p. 34 (Journal of the Dalmatian Club of America) Online PDF 34 kB, accessed 1 September 2013. ^ "AKC agrees to register low uric acid Dalmatians". Dog World. Archived from the original on 5 October 2011. Retrieved 29 July 2011. ^ "Registration Rules and Regulations (B Regs)". The Kennel Club. Retrieved 12 January 2010. ^ "Registration of a Low Uric Acid Dalmatian Import from the USA". The Kennel Club. 12 January 2010. Archived from the original on 25 March 2012. Retrieved 12 January 2010. ^ "Backcross Dalmatians – The UK Dalmatian Clubs Respond". British Dalmatian Club. 2 February 2010. Retrieved 21 March 2011. ^ "About the Project". The Dalmatian Heritage Project. Retrieved 20 December 2014. ^ a b "''Fédération Cynologique Internationale Standard of Dalmatian'', No. 153, dated 14 April 1999" (PDF). Fci.be. Retrieved 26 October 2011. ^ a b c d e f "FCI-Standard N° 153 – DALMATIAN (Dalmatinski pas)" (PDF). Hks.hr. Croatian Kennel Club. 30 May 2011. Retrieved 22 May 2012. ^ "The Kennel Club". thekennelclub.org.uk. ^ Schneider-Leyer, Erich ; Fitch Daglish, Eric. Dogs of the World, Popular Dogs, 1964. ^ a b c "Fire buffs traditions". Windsor Fire. Archived from the original on 30 July 2013. Retrieved 20 January 2013. ^ "The history of Dalmatians in the fire service". 10 February 2017. Retrieved 11 September 2018. ^ "Fire Dogs and Fire Horses". Publicsafety.net. Retrieved 26 October 2011. ^ "British Carriage Dog Society". carriagedog.org. Archived from the original on 19 November 2014. Retrieved September 1, 2014. ^ "One Hundred and One Dalmatians (1961)". Web.archive.org. 7 March 2008. Archived from the original on 7 March 2008. Retrieved 26 October 2011. ^ "Internet Archive Wayback Machine" (PDF). Web.archive.org. 1 November 2005. Archived from the original (PDF) on 1 November 2005. Retrieved 26 October 2011. Wikimedia Commons has media related to Dalmatiner.